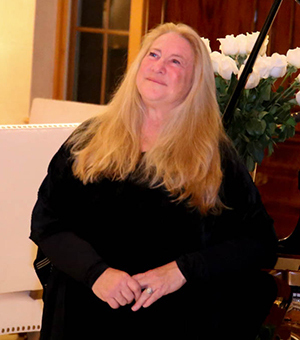 Victoria McCullough graciously hosted a gathering for the EQUUS Foundation at her magnificent, sprawling private home and horse farm on Friday, January 26th in Wellington, Florida. 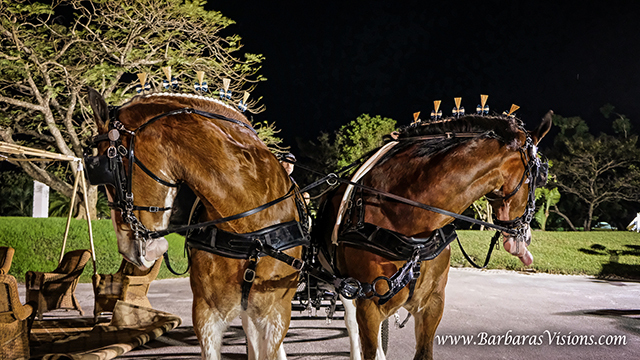 Guests were greeted by McCullough's Champion Clydesdales in harness with their manes and tails in traditional draft horse show braids, pulling carriages decorated with EQUUS Foundation ribbons and treated to rides throughout the property. 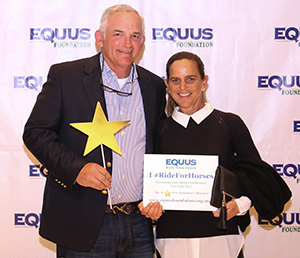 "The timing could not have been more perfect," said EQUUS Foundation President Lynn Coakley, "as Victoria just received the EQUUS Foundation Humanitarian Award the week before at the Pegasus Awards Dinner on January 18th during the US Equestrian Annual Meeting in Lexington, Kentucky. It was a wonderful way to honor her among her friends and admirers in Wellington." The gathering's dual purpose was to promote and gather support for the work of the EQUUS Foundation and to applaud the incredible horse protection work of McCullough, who has rescued over 11,000 horses from slaughter, and has worked tirelessly for a decade to keep horse slaughter facilities closed in the United States and ban the transportation of over 100,000 American horses across the border for slaughter each year. "Horses have Victoria to thank for so much - she inspires all of us!," said Senator Joe Abruzzo - sentiments echoed also by Congresswoman Lois Frankel of Florida's 21st District. Guests of the gathering enjoyed cocktails, live music, networking with fellow horse lovers, and learning about the mission and work of the EQUUS Foundation, the nation's only animal welfare charity 100% dedicated to protecting America's horses and strengthening the bond between horses and people. 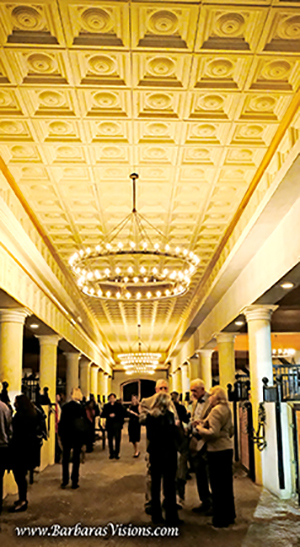 "I felt like I was walking onto the set of a fantasy movie," said Gail Chasin. "The house, the horses, the host, the guests, the cause . . . It was all so beautiful and inspiring!" 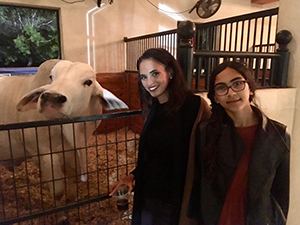 In addition to the carriage horse rides, guests were invited to tour the barns on the property where McCullough's Clydesdales and show jumpers reside, as do her many rescued horses – and cows! 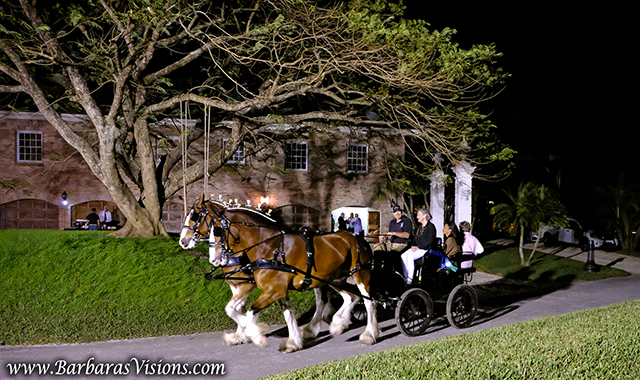 "We were heartened to see so many guests touring the barn and connecting with the many horses rescued from slaughter by Victoria - horses of all breeds, sizes, ages and disciplines that are ambassadors for the many thousands of similar at-risk horses across the country that could have quality and meaningful lives," said Valerie Angeli, EQUUS Foundation VP of Communications. In addressing the guests, McCullough said, "I support the EQUUS Foundation because it focuses on making sure that equine charities are operating at the highest standards of horse care and are fully transparent and accountable to the public, and only those charities receive financial support from the EQUUS Foundation." "The EQUUS Foundation is all about educating horse lovers and the public about these issues and asking them to step up to safeguard the comfort and dignity of horses throughout their lives and share their ability to empower, teach and heal with as many people as possible. We are thrilled to have Victoria McCullough on our side!" continued Angeli. Emcee Brian Lookabill captured the attention of the guests following McCullough's remarks with a live auction offering "A Week in Provence" donated by Jeannine & Andrew Flower - which was won by Ashley Brown and also Kristen and Scott Zankl, when the Flowers decided to make their home available to the two highest bidders. Lookabill then offered a unique opportunity to award an EQUUS Foundation grant in the name of the donor or in the name of a loved one or beloved equine companion. 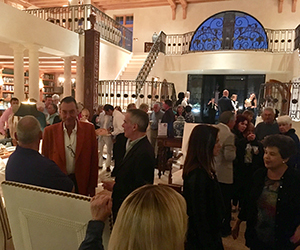 The EQUUS Foundation raised over $35,000 from the live auction in a matter of minutes. 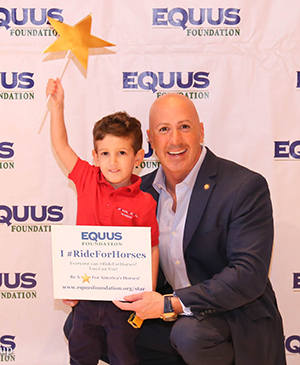 Senator Joe Abruzzo and his son are stars for America's horses. Photo by Phelps Media Group. 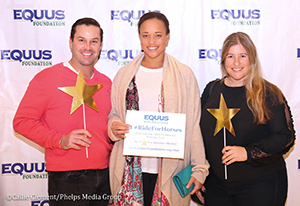 EQUUS Foundation EQUUStars Georgina Bloomberg, Paige Johnson and Jessie Springsteen joined the EQUUS Foundation to motivate fellow equestrians and horse lovers to take action on behalf of horses when their competitive careers are over. EQUUS Foundation EQUUStar Paige Johnson (center) with Rob Jones (left) and guest (right). Photo by Phelps Media Group. 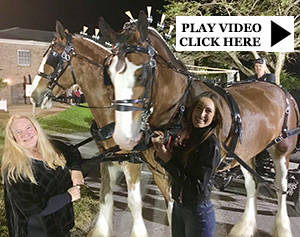 Victoria McCullough & EQUUStar Jessie Springsteen #RideForHorses with Clydesdales, Parker and Sky. Photo by EQUUS Foundation. McCullough's Clydesdales raring to go for the next EQUUS Foundation event! Stay Tuned! Join us for Saturday Night Lights with the EQUUS Foundation (www.equusfoundation.org/wef) on Saturday, February 24th for a unique opportunity to spend an intimate and exciting evening in support of the work of the EQUUS Foundation featuring cocktails, an auction and a buffet dinner ringside at the Palm Beach International Equestrian Center to watch the $384,000 CSI 5* Grand Prix. About EQUUS Foundation: The EQUUS Foundation, a 501(c)(3) public charity established in 2002, also known as Horse Charities of America, the only national animal welfare charity in the United States dedicated solely to horse welfare and the horse-human bond. Donations are tax-deductible to the full extent of the law. Contact the EQUUS Foundation, Inc., at 168 Long Lots Road, Westport, CT 06880, Tele: (203) 259-1550, E-Mail: mail@equusfoundation.org, Website: www.equusfoundation.org.